Wrocław was the first city in Poland to carry out a research project to develop a solution to enable guiding coaches to the nearest vacant parking space. The system is a result of research conducted by the city in cooperation with Emitel, ReviveMachines and NaviParking. It is widely estimated that one third of all vehicular traffic in cities is generated by drivers looking for a vacant parking space, which also results in a reduction of the efficiency of car parks, disruption in the flow of traffic on the roads and increased exhaust emissions. This issue also concerns coaches, which are present in Wrocław all year round. “As a city, we are constantly looking for solutions that improve the quality of life, often by using modern infrastructure and innovative technologies. As part of the CityLab programme, we carried out a research project together with ReviveMachines, NaviParking and Emitel, which ran for 7 months. As a result, we developed and tested a parking space occupancy detection system, which we are releasing now,” said Jakub Mazur, deputy mayor of Wrocław. The testing involved installation of 52 sensors in kiss-and-go parking zones, where coaches can park for up to 15 minutes, as well as in standard parking lots with unlimited parking times. The scope of the project covered nearly half of all available parking lots for coaches located in the area of the biggest tourist attractions in the city centre and in the neighbourhood of the Zoological Garden, including on Ofiar Oświęcimskich, Łaciarska, Świętokrzyska, Purkyniego and Wybrzeże Słowackiego Streets. “Thanks to employing the LoRa Wan technology, which enables devices to connect to the Internet while ensuring minimal power consumption, we managed to connect the sensors to a base station, creating a network that allows us to oversee the use of parking spaces. Emitel takes advantage of this solution not only for that purpose, but also to check the status of trash cans in the city or to create urban heat maps”, said Maciej Staszak, Vice-President of the Management Board of Emitel S.A. The cooperation resulted in the development of a useful and clean mobile application, which enables the drivers to find the nearest kiss-and-go zone or a parking lot, as well as finding out the price and distance to go. “Our goal is to develop future mobility and provide user-friendly solutions using open data. The interest of the city of Wrocław in innovative technologies has contributed to the implementation of a solution that facilitates the management of coach traffic. Based on the collected data, the application aggregates information about all car parks in the city. Coach drivers can see the current occupancy status of the parking lots, and the built-in navigation system can guide them directly to the car park of their choice. By reducing unnecessary traffic, the solution supports the flow of traffic in the city for the benefit of drivers, residents and tourists living there”, Marek Stawiński, President of NaviParking, explained. The research project aimed at looking for solutions to facilitate work in the tourism sector by making the flow of traffic generated by coaches smoother and by shortening the time needed to find a parking space. Additionally, its actual implementation will bring benefits to the residents of Wrocław, in particular by limiting the traffic of coaches driving around the city while waiting for tourists and – by extension – cutting down emissions. The Employee-Friendly Employer Contest has been organized for 11 years by the National Committee of the "Solidarity" Trade Union under the honorary patronage of Poland's President. The objective of the contest is to promote employers who distinguish themselves by applying good practices in such fields as compliance with the labor laws. The Certification Committee evaluated the applications sent to the contest considering, among others, compliance with the labor laws, conclusion of collective agreements, concluding employment contracts for an unspecified period of time, trade union membership rates, and functioning of workers' councils. Emitel S.A. received an award along with such companies as Jastrzębska Spółka Węglowa S.A., Kopalnia Soli "Wieliczka" S.A., and Poznańskie Zakłady Zielarskie "Herbapol." "We are involved in a lot of projects intended to create a friendly and attractive work place for the employees of Emitel. People are our greatest asset and this is why we pay a lot of attention to such matters as safety and direct or indirect support to our employees and their families. The results of our HR policies are manifested in the annual study of the level of involvement and satisfaction of our employees, which has lots of participants who express very good opinions about our company," said Andrzej Kozłowski, the President of the Management Board of Emitel S.A. Candidates for the "Employee-Friendly Employer" title are nominated by the "Solidarity" Trade Union organizations in respective companies. The winners of the contest respect the rights of employees and conduct social dialog in their organizations. The certificate may be used for three years after it is awarded. The statuettes will be handed by President Andrzej Duda on 19 March 2019. In the recent months, together with the Polish Radio and with participation of the Ministry of Interior and Administration, Emitel has successfully performed tests of the emergency notification system. If the service is started, owners of digital radio receivers can be automatically informed about emergency situations. The Ministry of Interior and Administration supports the soonest possible implementation of the system. Sending emergency notifications is one of the added values of the digital radio system. This functionality enhances the utility of the digital radio technology and very strongly contributes to implementation of the national security strategy. "T-DAB+ is the fastest developing broadcasting technology in Europe. It is already in use in 22 European countries. The T-DAB system covers a population of 470 million people worldwide. In addition to broadcasting of radio programs, the technology also enables broadcasting of emergency situation messages. Emitel has many years of experience in digital radio technologies. We are happy that our competences could be used in the performance of the emergency notification tests," said Maciej Staszak, Vice-President of the Management Board of Emitel S.A. The first country that completely stopped analog broadcasting is Norway. After the digitization, the number of nationwide radio stations in that country increased from five to thirty-one. Recently, the European Parliament has decided that in two years all radios installed in cars will be required to be able to receive digital signals and IP streaming. In Poland, regular digital broadcasting is currently performed only by the Polish Radio. The range of the emission covers nearly 56% of Poland's population. The listeners have eight programs to choose from: Jedynka, Dwójka, Trójka, Czwórka, Polskie Radio 24, Polskie Radio Dzieciom, Radio Chopin, adn Radio Poland. Besides nation-wide programs, also the Regional Stations of the Polish Radio are available, which reach the listeners thanks to regionalization of the signal in the territories of the different provinces. On the occasion of the International Radio Day and the nineteenth anniversary of the decision to build the radio mast in Raszyn, Emitel provided among others a historical transmitter lamp and a telecommunication cabinet to the Transatlantic Broadcasting Station Culture Park Association. The equipment will be used for research purposes and later will become an exhibit in the planned museum of the Transatlantic Broadcasting Station. The members of the association are young scientists and doctoral students who are fascinated by the history of the pre-war broadcasting station located at the border of the present communes Bemowo (Boernerowo) and Babice. The Transatlantic Broadcasting Station was in operation only for 22 years and consisted of 10 masts that were more than 126 meters tall. It was completely destroyed by Germans in 1945. Its twin station, the Varberg Radio Station in Sweden, which is still in existence, was included on the list of World Heritage sites in 2004. "Reconstruction of the Transatlantic Broadcasting Station is not possible but, among others thanks to the help of Emitel, we want to restore the old Brown Boveri transmitter, which will become the main exhibit of the planned science center. We are trying to make sure that the museum of the Transatlantic Radio Station is built in the vicinity of its ruins and we appreciate the help in collecting exhibits for the museum," said Jarosław Chrapek, President of the Management Board of the Transatlantic Broadcasting Station Cultural Park Association. The founders of the museum are planning to start an amateur short-wave radio station and a telecommunications club that will give a "new life" to the Babice Radio Station on the airwaves under its historical call sign - AXL. The telecommunication cabinet provided by Emitel is identical as the cabinet in which the transmitter was installed in the Broadcasting Center in Konstantynów. "Polish radio broadcasting is at the threshold of digitization but we are happy to see enthusiasts who want to remember and commemorate the history of Polish radio communication. We are pleased that Emitel, whose history is more than half a century long, was able to contribute to the construction of the Transatlantic Radio Station Science Center and Museum," said Maciej Staszak, the Vice President of the Management Board of Emitel S.A. Until the museum is built, the equipment donated by Emitel will be stored at the Warsaw University of Technology where it will serve as a teaching aid for students and young scientists. The tests, which will be carried out by Emitel S.A. and Polskie Radio S.A, are slated to take place in December. The testing procedure will not cause any inconvenience for the audiences. The tests are designed to check how different types of DAB+ receivers work in the case of a sudden change of signal and content of broadcasts. The test multiplex used during the procedure features eight stations named PR TEST-1 to PR TEST-8 and is broadcast in Warsaw on channel 6D (187.072 MHz) with an ERP of 0.8 kW. The conducted tests will also encompass a solution using the EWF (Emergency Warning Functionality) concept, as well as a solution that will enable changing the content of broadcast programs to alert messages automatically. Test results may be used in the future to inform the general public about the risks and dangers. On the 7th of December, the hybrid terrestrial TV platform will start featuring video footage presented by Legia Warszawa. This is the first project of its kind in Poland, which stems from cooperation between the Warsaw-based football club and Emitel, the technical terrestrial television operator in Poland. The new service will also feature live broadcasts and other interactive content produced by the Warsaw-based club. 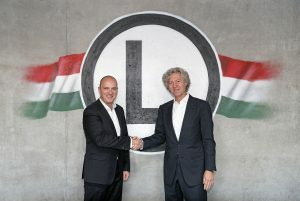 Thanks to the cooperation between Legia Warszawa and Emitel, the Multiplex 8 hybrid TV portal will feature content produced by the Warsaw-based football club, including materials currently available on the club’s YouTube channel, as well as –eventually – unique content and broadcasts from sparring games. In the beginning, the new service is going to present things such as behind-the-scenes information from games, “Ł3” Studio and club news unavailable on traditional television. “Terrestrial TV remains the most popular platform for watching TV broadcasts in Poland. The launch of the video content channel on Multiplex 8 will enable Legia Warszawa to reach an even wider group of fans all over Poland. It is also a pioneering solution in Poland – the channel of the Warsaw-based football club is the first such channel to appear on the hybrid multiplex platform. This is a good direction, because the trends observed around the world show that traditional television and the Internet are becoming more and more interspersed, while many viewers expect access to additional content on their TV screens,” says Andrzej J. Kozłowski, President of the Management Board of Emitel S.A. As part of the additional services available on Multiplex 8, Emitel provides viewers with a hybrid television service – the so-called HbbTV – offering additional services such as a guide to television broadcasts, current news, weather forecast and radio broadcast offer, including RMF, Radio ZET and the Polish Radio. Now the hybrid television offer is going to be enriched with video content produced especially for the fans of Legia Warszawa – the largest and most recognisable football club in Poland. “The production and distribution of video content is one of Legia's strategic marketing and commercial objectives. We are among the most media-oriented Polish brands, our fans expect us to provide them with exclusive materials showing what the club looks like behind-the-scenes. We already reach millions of people through our social media. Cooperation with Emitel will enable us to further increase the our impact and take advantage of the potential of hybrid television. The new platform will also enable us to develop our e-commerce activities and to offer innovative solutions for our sponsors,” said Dariusz Mioduski, President of Legia Warszawa. Terrestrial TV in Poland is used by over 6 million households, which makes it the most popular platform for watching TV broadcasts. The ever-increasing availability of broadband Internet is driving the consumption of multimedia content. One of the forms of delivering such content to viewers is hybrid television, which is dynamically developing in countries such as Germany and France, in particular in terms of sports-related content. Thanks to the use of HbbTV, the Sport1 TV channel provides additional attractive content for football fans. Audiences can play clips from the Bundesliga, Primera Division, Serie A, Ligue 1, UEFA European League, as well as fragments of Der Volkswagen Doppelpass, a programme for German football fans, which enjoys the greatest popularity in the country. Hybrid TV services enable the viewers to turn an ordinary TV into a multimedia entertainment centre. The ability to play multimedia content delivered over the Internet enables the broadcasters to provide additional content on demand, as well as taking advantage of streaming content delivery method. HbbTV also enables the implementation of innovative, interactive and personalised advertising campaigns, which significantly increases their effectiveness. Additionally, HbbTV enables taking advantage of interactive applications provided over the Internet on TV sets. Pairing the application with the broadcast provides an opportunity to interact with the audience, as well as to run contests and quizzes and to provide additional information related to the current broadcast. The portal can be used by all viewers of digital terrestrial television receiving Multiplex 8 programmes with a TV set connected to the Internet and supporting HbbTV functionality. Virtually all TV sets currently offered in retail chains in Poland are equipped with this functionality. The “Investor in Human Capital” emblem is the first Polish award for companies that distinguishes their staffing policies. The title is awarded on the basis of a survey of employee opinions. Winning the emblem means that Emitel has joined the prestigious group of Laureates who meet the highest standards in the field of HR policies implemented in the companies and at the same time these activities are both recognised and appreciated by employees. For the last 4 years, Emitel has been conducting the anonymous Emipuls employee opinion survey. The 2018 edition was completed by a record number of employees – 87.4% of all staff. 91.6% of them gave a positive answer to the question regarding job satisfaction. The “Investor in Human Capital” emblem was awarded based on the results of the Emipuls survey. “We are glad that the Emipuls survey was noticed by the Jury of an award - particularly one as important as the ‘Investor in Human Capital’. Apart from taking care of the natural environment and building great relationships with local communities, employee satisfaction is one of the foundations of Emitel’s operations. The fact that the majority of our staff readily takes part in the Emipuls survey and rate working with the company’s leadership and HR department so well makes us even more happy. What we appreciate the most, though, is the fact that they want to work with us,” said Anna Goleniowska, HR Director at Emitel S.A. The “Investor in Human Capital” emblem has been awarded since 2002. It is the first and only programme based entirely on employee opinions. The ranks of laureates to date include companies such as Link4, Fedex Express, Bricoman and Man. Eurozet Radio Sp. z o.o. and Emitel S.A. have concluded a new ten-year contract for the provision of transmission and broadcasting services of “Antyradio” radio station in selected areas of Poland. Antyradio is the largest and longest-running rock radio station in Poland. It uses 16 transmitters covering the largest Polish cities. The radio station is famous for its uncompromising approach to reality and strong personalities presented on air. The programme of the station is addressed to all those who follow their own path and do not conform to the mainstream pop culture. The station was established in 2005 as a result of the merger of Radio 94 (Warsaw) with Radio Flash (Katowice). It offers a whole spectrum of the best Polish and foreign rock music – from classics to noteworthy new releases – as well as repertoire ranging from reggae to hard rock. Apart from music, Antyradio devotes a lot of space to the automotive industry and stigmatisation of the absurdities of the surrounding reality. Since 2007, the station has been part of the Eurozet Group. The new agreement between Emitel S.A. and Eurozet Radio Sp. z o. o. maintains the existing scope of services. It was concluded for the entire ten-year term of the broadcasting license and concerns 10 broadcasting stations. Like in the case of the contract concerning Radio ZET, the cooperation has been extended to include new elements that will provide broadcasters with additional security of the transmitting and broadcasting network. In the event of a malfunction, Emitel guarantees, among other things, backup equipment and alternative broadcasting stations for the duration of planned maintenance and repair breaks. From now on, the full technical responsibility for signal transmission and its broadcasting based on all the Operator’s own equipment will rest with the Operator. The agreement enters into force on the 1st of December 2018. Emitel S.A. and Radio WNET Sp. z o.o. have signed a 10-year contract for broadcasting and transmission of Radio WNET programme in Krakow and Warsaw. Launching the transmitters means that Radio WNET will expand its digital broadcasting activities on the Internet with analogue broadcasting over the airwaves. Established in 2009, the radio station existed as an online radio broadcaster and a social network, with only some of their broadcasts being rebroadcast by other traditional radio stations. Now, Radio WNET will be able to broadcast its own programme on its own frequencies in the former and present capital of Poland. “This is an important juncture for us, since from the very beginning we knew that sooner or later we would broadcast in FM technology. The nine years that we spent working on the Internet equipped us with the experience necessary to face the challenge of FM broadcasting. We hope to be able to increase the number of our transmitters in the future,” says Krzysztof Skowroński, co-founder and President of the Management Board of Radio WNET. The ten-year agreement concluded between Emitel S.A. and Radio WNET Sp. z o.o. is the first joint venture of both companies. “We are looking forward to the development of cooperation with our new Client and we are going to support them in all their efforts to increase the licensed broadcasting power in the future. We are happy that Radio WNET chose Emitel as an experienced and proven provider of radio and communication services,” says Andrzej Kozłowski, President of the Management Board of Emitel S.A WNET Radio transmitters in Warsaw and Krakow will be launched on the 10th of November at 6:18 p.m. The radio station announced that the first broadcast will start on the 11th of November at 11:11 a.m.
Emitel S.A. was awarded the title of Trustworthy Employer in the Safety category, which is yet another distinction won by the company for its focus on employees and social policy in national competitions. The new title will be added to other prizes and accolades won by Emitel, including two Reliable Employer titles, the title of an Employer Favourable to Employees, as well as Employer Favourable to Employees Aged 50+. Out of concern for the safety of the company’s employees, Emitel organises training courses teaching them safe driving techniques, equips workplaces with automatic defibrillators and blood pressure measuring stations, trains employees in first aid, finances flu and tick-borne encephalitis vaccinations, conducts educational campaigns by organising OHS Weeks and publishing OHS Bulletins. “All our activities in the field of employee safety are aimed at every age group, which fits well with the idea that taking care of health and safety at the very beginning of one’s professional career gives one a better chance to safely reach the finish line. The fact that Emitel employees share the opinion of the Trustworthy Employer competition jury is evidenced by the average tenure in our company, which amounts to 19 years”, said Aleksander Skołożyński, Member of the Management Board of Emitel S.A. The company offers its employees attractive employment conditions and development opportunities, particularly in its current areas of activity – “projects of the future” such as building smart cities and the Internet of Things. These are projects that create space for unleashing creativity and innovation of employees, who can turn their curiosity of the world into concrete actions and projects. “We appreciate and respect the talent and commitment of our employees, making every effort to make full use of their potential. We attach great importance to the quality equipment used by our employees working at heights, as well as to the relevant procedures and proper training courses observed and used by all of our workers. We install equipment increasing driving safety in our company vehicles”, says Aleksander Skołożyński. The Trustworthy Employer Competition is an initiative proposed by the Polish Chamber of Commerce and the “Poland: Now” Polish Promotional Programme Foundation. The award has been presented for 9 years now. Its main objective is promoting responsible labour and social policies, in line with European standards among employers. The title is given to institutions which use effective and efficient solutions in their labour policies, taking into account the professional development of their staff and ensuring their rights. Eurozet Radio Sp. z o.o. and Emitel S.A. have concluded a new ten-year contract for the provision of transmission and broadcasting services of “Radio ZET” radio programme across Poland. Radio Zet is one of the pioneering organisations transforming radio broadcasting in Poland. The first broadcasts took place in 1990 in Warsaw. Thanks to the extension of their broadcasting licence to include the whole Polish territory, in 1994 Radio Zet started broadcasting in many new areas, taking advantage of the unique technical infrastructure provided by Emitel. The previous agreement between the companies was effective from January 2013. By signing a new ten-year contract, Eurozet decided to go with a reliable technical partner with the greatest experience on the Polish radio services market, which guarantees the highest quality of service. The cooperation will enable the achievement of business objectives of the radio and creating the best programming offer for the listeners of Radio Zet. “The radio sector in Poland is doing great. In the era of ever-changing technology, the growing popularity of streaming services and mobile market, which we consistently take advantage of, the FM signal still remains the most popular source for the audiences thanks to the enormous number of receivers. That is why it is important for us, as one of the market leaders, that the quality and range of FM Radio ZET signal are as good as possible. The new contract concluded with Emitel will enable us to maintain the high quality level of our broadcasts,” says Andrzej Matuszyński, CEO of the Eurozet Group. The new contract was concluded between the parties for a ten-year period of the new broadcasting license. It covers broadcasts from 55 Emitel broadcasting stations across Poland. The cooperation has been extended to include new elements, which will provide the broadcaster with additional security of the broadcasting network. In the event of possible failures and malfunctions, Radio Zet will have backup equipment and alternative broadcasting facilities at its disposal at all times for the duration of planned maintenance and repair downtime. Full technical responsibility for signal transmission and its broadcasting based on the Operator’s own devices will be assumed by Emitel. Thanks to this solution, the broadcaster will be able to focus on preparing the best possible programming offer for the audience. The new contract also includes the possibility of presenting multimedia content of the Eurozet Group on a hybrid TV platform on Multiplex 8 of terrestrial television, operated by Emitel. “I am glad that the Eurozet Group has decided to go with Emitel’s services for the next 10 years. This mutual trust, which we have been building and fostering for a long time has resulted in a much broader scope of cooperation, which was described in the new contract. Radio Zet focuses on continuous growth in Poland and I am pleased that Emitel can support one of our key clients in these efforts,” said Andrzej Kozłowski, President of the Management Board of Emitel S.A. In Koszalin, Emitel has just commissioned a backup Supervision and Control Centre of GMDSS – global maritime distress and safety system. The back-up centre is equipped with the highest quality radio-communication system, just like the main facility located in Jarosławiec, and should the need ever arise, it will be able to take over all the tasks required by the GMDSS. The centre in Jarosławiec has been operating for 27 years without a single failure to date; however, Emitel has decided to bolster the current system and infrastructure, which resulted in the commissioning of a back-up centre in Koszalin. The Polish maritime communication system, operated by Emitel, is considered to be one of the best in the world. It has been saving seamen both in Polish territorial waters, as well as outside them, for which the Ministry of Maritime Economy and Inland Navigation has often received words of gratitude from our foreign partners. The staff of the GMDSS Supervision and Control Centre consists of ten people, including seven women. “It’s no wonder, since we sometimes have to play the role of psychologists. I recall the night when I received a signal from a sailor on the Red Sea, he was in a very bad emotional state. I talked to him throughout the entire twelve hours of my shift, while listening for anyone else who might be calling for help. Luckily he managed to reach the port. Later, he sent me his thanks”, said Beata Nowak, Manager of the Jarosławiec Centre and long-time system operator. All employees of the Centre have a long very long experience in this role – 28 years on average, but there are also those who have been keeping their watchful eye on the safety of sailors for as many as 40 years. “You cannot simply come here and expect to be able to work straight away. Young, inexperienced employees who have not yet learned all the procedures often start to panic when they hear the call for help. Staying calm is paramount, because there are people at sea who are overwhelmed with emotions and only staying calm can save them. I can already sense the seriousness of a situation from the tone of voice of the sailors calling for help,” says Beata Nowak. GMDSS operators are like flight controllers. They must be vigilant and on standby all the time – this job requires people to be able to divide their attention and to have attentive ears – you never know whether you are going to receive another distress call while talking to some sailors in dire need of assistance. The infrastructure and operation of the system is not cheap, but safety has its costs. Emitel is a member of the International Association of Marine Aids to Navigation and Lighthouse Authorities (IALA) and therefore actively participates in the development of new technologies and has the necessary know-how to implement them. In March this year, the operator started testing VDES – a data exchange system based on VHF radio communication between vessels, coastal stations and satellites in Automatic Identification Systems (AIS) – and invited the Marine Search and Rescue Services to participate in these tests. This system will soon be introduced as a data transmission standard and will be systematically implemented worldwide. Emitel has already invested in technical solutions, has launched the system in its own laboratory and is ready to start testing. On the 1st of August this year. President Andrzej Duda signed the Act on the National Cyber Security System as a response to the Directive of the European Parliament and the Council of the European Union concerning measures for a high common level of security of network and information systems across the Union. The Directive states the obligations, which need to be fulfilled in order to ensure the cyber security of information systems in service sectors of key importance for the country and its citizens. Therefore, Emitel has implemented a system for detecting cyber-threats in maritime communications and carrying out analyses of security incidents. The SIEM-class solution employed by Emitel is an advanced analytical tool that provides automatic, near real-time response to threats. Thanks to this solution, the security measures are fully compliant with legal requirements and guarantee the reliability and stability of the services provided. The ISO/IEC 27001:2013 certificate awarded to the operator serves as a proof of the company’s commitment to information security of our partners and a guarantee of confidentiality, availability and integrity of the services provided, as well as setting a new standard in Poland. Thanks to the network designed and installed by Emitel engineers, Stadion Śląski in Chorzów joined the modern, global arenas such as Wembley. It is the second such facility in Europe where the so-called DAS system. Thanks to this, there will no longer be any problems with communication in sectors where problems with the coverage of mobile networks have so far appeared. In the past, during major events, some parts of the Silesian Stadium had insufficient access when it comes to connections to mobile networks. Viewers, journalists and other people often had problems making calls or using the mobile internet. Thanks to the new system installed in these areas, the situation will change completely. "We want the Silesian Stadium to be a modern facility in many respects, we also want the most modern solutions for wireless communication systems. First of all, we decided to strengthen the signal in the hospitality and competition zone within the eastern tribune, as well as in the business zone on the 30th western grandstand sector. In the future, we plan to expand signal strength throughout the facility, "says Krzysztof Klimosz, president of the board of the Silesian Stadium. Distributed Antenna System (DAS) is a system that increases network capacity, which is usually difficult to ensure using standard technical solutions. Antennas are installed in key locations and limited to the smallest dimensions, so as to blend in with the landscape and not interfere with the architectural order. However, they increase the availability and comfort of using wireless cell phones by users. "This is the first such solution in Poland and one of the first in Europe. The client set us a task to do in extremely ambitious time. I am glad that Emitel specialists proved to be a reliable and upcoming match of the Polish national team within the League of Nations will be played on the most modern wireless stadium in our country - says the president of the board Emitel S.A. Andrzej Kozłowski Emitel made the project and installation in record time, just a few weeks. The system is available to users of all cellular networks. About Emitel Emitel is a leading operator of terrestrial radio and television infrastructure in Poland. The company is a leader in digital radio and television broadcasts and services based on modern wireless communication systems. The company has over 60 years of experience in the field of wireless communication, and is currently taking an active part in the development of infrastructure for the needs of Smart Cities, Internet of Things (IoT) services. Since 2013, the owner of Emitel is the American fund Alinda Capital Partners, which is one of the largest companies investing in infrastructure projects in the world. Representatives of Wrocław and Emitel S.A. authorities signed a letter of intent aimed at jointly conducting tests related to the implementation of smart cities solutions. Technologies and services of the internet of things are to improve the living conditions of the residents and facilitate the management of the city. Wrocław is already cooperating with Emitel in pilot projects concerning the control of occupancy of parking spaces for tourist coaches in the city center and monitoring of urban heat islands. Emitel provides solutions based on the LoRaWAN network, which allows communication with the sensors. Successful implementation of projects prompted partners to expand cooperation with new areas. "Due to the fact that Emitel is one of the leading Polish companies in the field of services based on modern wireless communication systems, we started talks about cooperation and using this potential to create new solutions in the area of the city of Wroclaw" - said the vice-president of Wroclaw Maciej Bluj during signing of the letter of intent. As part of the cooperation, the role of Emitel will be to expand wireless communication systems that will allow city authorities to use the internet of things solutions in many areas of urban life. Thanks to this, local governments will be able to implement solutions that facilitate the everyday life of residents and make better use of available resources and reduce maintenance costs. "We are pleased that Wrocław aspires to the role of a leader in the implementation of smart city solutions and that it has decided to use Emitel's experience. Our company meets the local governments supporting them in the construction of modern, friendly and convenient solutions for residents "- said Maciej Staszak, vice president of the board at Emitel during the ceremony. Jointly implemented project utilizes new fault detectors and LoRaWAN communication and is directed to Distribution Network Operators (DSO). As part of the cooperation, Emitel will build a data transmission network which will be used by ZAE detectors to send messages of the power grid condition. "The Smart Grid systems developed in the DSO structures have the function of transmitting measurement data and alarms by radio, which allows quick reconfiguration of the network and re-switching the current after excluding the affected section. Our role as constructors and suppliers, with many years of experience of specialized electronic devices for the power industry, is combining with new technologies of data transmission and processing - this is a new quality "- said Mirosław Szeleziński, President of ZAE. "Emitel already has extensive experience in the LoRaWAN network that supports smart cities solutions, which is why we are happy that we can cooperate in this project. The area of cooperation between companies is very promising and holds a special place in Emitel's development strategy. The use of low-energy LPWAN network enables the installation of signaling devices in every facility where such a need occurs. The advantage of Emitel is undoubtedly the ability to provide access to devices installed throughout the country, "said Maciej Staszak, Director of Strategy and Development, Vice President of the Board. Emitel S.A. and ZAE Sp. z o.o. establish cooperation in the implementation of a short-circuit detection system in medium voltage power grids. The Emitel Information Security Management System implemented by the Company was approved by the ISOQAR certification body from Great Britain. System application of the standard guidelines and their implementation in business processes gives the possibility to minimize the risk of adulteration, loss or unavailability of information, which in the light of technological development becomes a prerequisite for ensuring business continuity. Emitel attaches particular importance to the data security of our current and future customers. The company uses the most modern and effective solutions in this field, guaranteeing contractors the highest standard of full protection of their privacy - from organization of information security, through access control to compliance with legal requirements. In total, the certificate covers 11 areas of activity. The ISO / IEC 27001: 2013 certificate is awarded to IT companies, banks and subsidiaries of international corporations. It was first granted in 2005 in Great Britain, since 2007 it has been awarded in Poland. "Increasingly, information is the most valuable business asset, and its recovery in the event of loss can be a very costly and complicated process. That is why we directed our attention and actions to its proper protection. We have decided to implement a systematic approach throughout the Company, under which we will manage comprehensive information assets, infrastructure intended for processing and information security risks. ISOQAR certification is the culmination of our activities. "- said Aleksander Skołożyński, Member of the Board Emitel S.A.
Emitel joined the elite group of nearly 100 Polish companies that have the ISO / IEC 27001: 2013 certificate. International Association of Marine Aids to Navigation and Lighthouse - in short IALA is an international organization that brings together national institutions responsible for nautical navigation, producers, distributors or consultants in the field of navigational aids. During the meeting of the IALA Council, which took place at the end of May in South Korea, Emitel was admitted to the group of associated companies and institutions. Membership in the organization is a great distinction. Radiocommunication is a specific field of telecommunications, consisting of radio communication with ships on the seas and oceans of the world. One of the most important functions of this communication is to provide safe navigation and help in life-threatening situations. In Poland, Emitel has been performing these functions for many years, providing a unique radiocommunication infrastructure and support for certified radio operators. Currently, Emitel has 9 transceiver stations located along the entire Polish coast. With the help of these stations, the modern communication center in Jarosławiec, known as "Witowo Radio", maintains communication with ships sailing in the Baltic Sea, provides assistance in the event of a threat to human life, transmits navigational warnings and medical advice. "We treat services provided by maritime radiocommunication with the utmost care because they serve to ensure safety and protect the lives of people at sea. Our long-term cooperation with the Maritime Search and Rescue Service confirms that we are a trustworthy partner. Access to the rich source of IALA knowledge will allow us to develop additional competences in this area and to perform our duties even better, "said Maciej Staszak, Vice President of the Management Board of the Company. Membership in an organization means many benefits. IALA is an organization that is piloting the development and implementation of digital radiocommunications, which is necessary for the creation of e-navigation services. The implementation of digital communications also opens up the possibility of implementing many other maritime communication services, including those related to the global maritime security system (GMDSS). Emitel will gain access to the results of the work of this organization's teams, can follow the development trends on an ongoing basis, which will allow testing and offering the latest maritime radio products to customers. Due to the fact that the health and life of people depends on the efficiency of the devices, the quality of their service and speed of reaction, tasks related to maritime radiocommunication take a special place in Emitel's operations.